Pro Scooters are mini 2 wheeled vehicles that are popular among children and adults alike. It’s one of the best ways to combine exercise with fun and explore your neighborhood, zigzagging your way through narrow lanes and alleys. Not only that, pro scooters are also a very economical option to move around as they don’t use up any fuel. They are pollution free and you can play your part in saving the environment by moving around in a pro scooter. 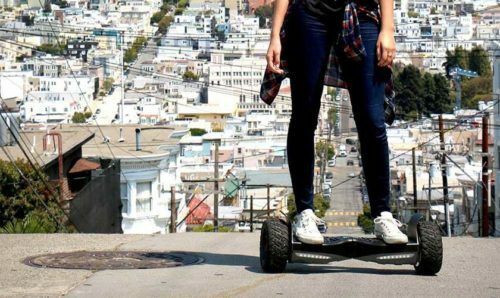 However, the market is inundated with pro scooters of all kinds and you would certainly want to get the best pro scooter for yourself. They come at different price points, in different builds and dimensions, each trying to appeal to a specific cross section of consumers. In our review we look at the ten best pro scooters in the market that will help you zero in on one. So, let’s dive in. The name Fuzion immediately evokes trust and confidence and is one of the best pro scooter brands out there. One of its most popular offerings, the Fuzion X 3 is perfect for anyone looking to make a mark in scooter riding. At just around 3.6 kg, this cool scooter sports an awesome lightweight design and employs superior components to give you one of the best pro scooters in the market. It is an ideal beginner scooter to learn the tricks of the trade before one moves on to bigger things. 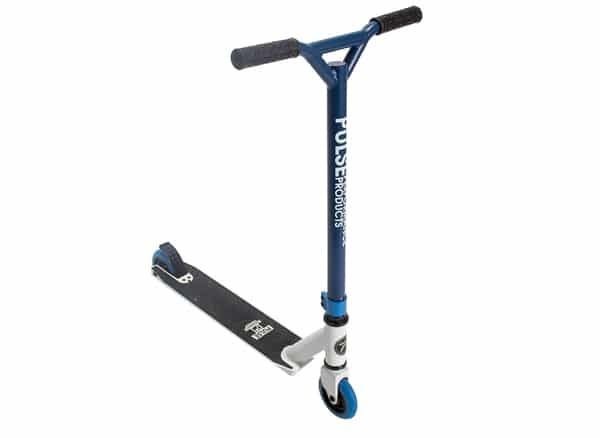 This pro scooter features a 4” wide aircraft grade aluminium deck and high tensile steel V bars for more strength and control. The nylon brake is designed for superior performance and has a good rugged design. The headset is sealed and has a threadless fork which allows for smooth operation so you can play your tricks to perfection. And the X3 does allow some tricks and is a good trick scooter for beginners. One can easily perform tricks like tail whips and board slides on this pro scooter. What’s more, when this scooter arrives, you only need to tighten three bolts to get it running. 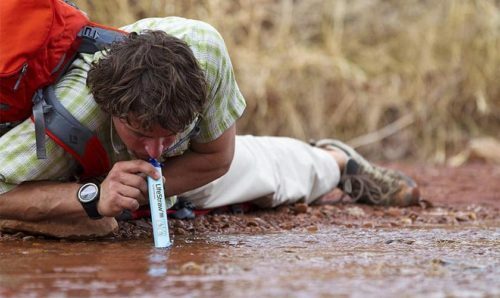 See more information on Fuzion X-3. 4” wide aircraft grade aluminium deck. Sealed head set for smooth operation. Perform tricks like tail whip and board slide. 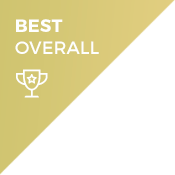 The Fuzion X3 is the best overall and top on our list of the best pro scooters. 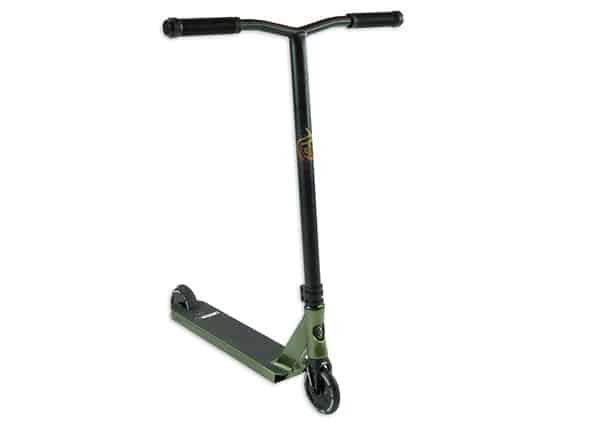 It is an ideal beginner scooter and a good trick scooter to learn basic tricks before one starts looking for top stunt scooters. That however, doesn’t mean that only pros should consider buying this vehicle. The superior components are designed to provide a smooth riding experience and this scooter is ideal for anyone wanting to take off on a ride in the neighbourhood. Reasonably priced, this pro scooter won’t be a burden on your pockets and is certainly worth going for. Yet another pro scooter from the Fuzion stable, the Fuzion Z375 will completely blow your mind with its amazing top of the line features. Custom built using the best individual components, this scooter is tailor made to be one of the fastest and lightest pro scooters and is ideal for pulling off any mind-boggling tricks one can fathom. On the looks front, the user can choose between two graphic packages to give their scooter a customised cool look. The Z2375 comes with an extra tall, 25” high and 22” wide aluminium handle bar with subtle contours for comfortable hand placement and 115 mm rubber hex grips for maximum comfort. The 4.5” wide and 20.5” long aluminium deck provides enough room to perform your tricks and this scooter also comes with an aircraft grade aluminium fork and sealed integrated headset for smooth and controlled operation. The wheels are 120mm in diameter with 6 spokes wrapped in 87 PU material. This lightweight scooter can carry weight up to 220 pounds and is ideal for intermediate and advanced riders above 8 years. It comes dialled and you only need to tighten a couple of bolts before you can use it. See more information on Fuzion Z375. One of the fastest and lightest pro scooters. Extra tall handle bar with comfortable grips. 4.5” wide and 20.5” long aluminium deck. Comes in two cool graphic package designs. Carry weight up to 220 pounds. The Fuzion Z375 is the second on our list and the best premium pro scooter. One of the most expensive scooters, this product promises a lot and delivers with top class components and awesome design to ensure maximum comfort to the user. Ideal for carrying out some of the most amazing tricks, it is one of the best stunt scooters in the market for intermediate and advanced pro riders. The Vokul S2 pro scooter comes at a cheap price but has features that can rival any higher end versions. 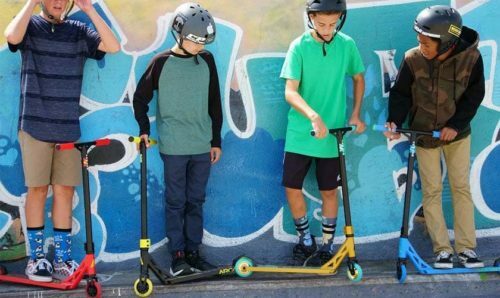 It’s an entry level scooter that will allow you do some basic tricks and is ideal for kids between 7-14 years having little or no prior experience with scooter riding. The deck is built in aircraft grade aluminium for strength and is close to 4 inches wide and 19 inches long. The U- shaped wing style handle bar is made of medium carbon steel, close to 24 inches long and 20 inches wide, has a triple clamp and comfortable grips. Weighing at 3.3 kg, this pro scooter is lightweight and can carry up to 140 pounds weight. It features a threaded headset which is good enough for carrying out some basic tricks. The 100 mm wheels are made of high- quality PU material. To add to the looks, the pro scooter has the company name and logo on the handle bar and comes in 5 different colour options. To get it started, you only require to tighten a few bolts to enjoy your scooter ride. See more information on VOKUL S2. Ideal for children between 7 to 14 years. Good beginner scooter for basic tricks. The Vokul S2 is a cheap pro scooter but comes with attractive features that will immediately catch attention. Its high-quality aluminium deck and steel hand bar along with the threaded headset give you a product which is sturdy and will perform smoothly. This may not be the best trick scooter but is good enough to perform simple tricks and ideal for beginners. Here’s a mid-range pro scooter from Urban riders from speedy plus series. Designed to carry some heavy duty, the Urban Riders 7 Plus has a sturdy design. The 4 inches wide and 20 inches long deck is made of aircraft grade aluminium for strong durability and enough room. The handle bar comes with bat-wing style handle and stands at 22 inches tall and 18 inches wide and is made of chromoly. The scooter comes fitted with a 3-pin clamp and a one-piece build fork. With a threaded headset and 100mm wheel made of high rebound cast PU material, this pro scooter is good enough for smooth riding. It can carry weight up to 220 pounds and is suitable for persons above 8 years. 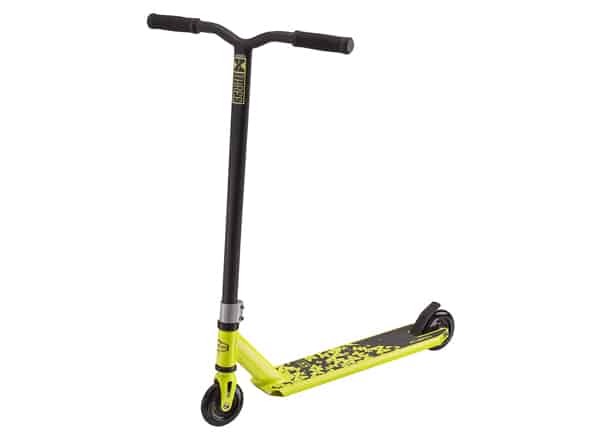 It is an ideal scooter for skateparks and you can start showing off your simple tricks with this vehicle. See more information on Urban Riders 7 Plus . Sturdy design to carry weight up to 220 pounds. High grade aluminium deck and chromoly handlebar. Suitable for persons above 8 years. The Urban Riders 7 Plus is a cheap good pro scooter in its category. It can make for a good beginner scooter and good scooter for skateparks. With its high-quality build, you can be sure of its durability and use it to learn the ropes of various tricks. The deck is wide enough to provide sufficient room for an enjoyable ride and the bat-wing styled handle lends the pro scooter a beautiful look. 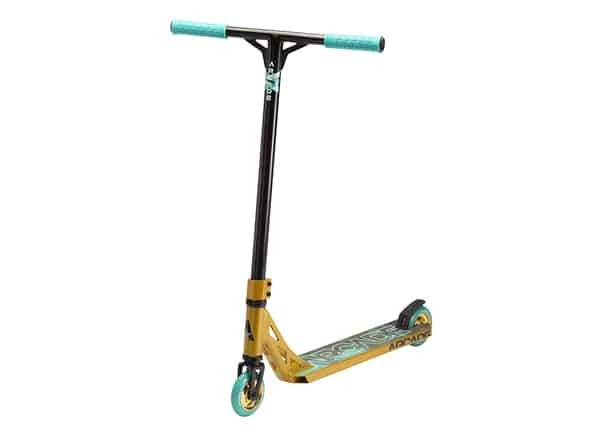 The Arcade Defender pro Scooter is a direct rival of the Urban Riders 7 plus in terms of price and most of the features but has a slightly sturdier build and comes with more colour options to give the product some beautiful looks. Designed to be a beginner scooter, the Arcade Pro has a slightly shorter aluminium deck at 17.5 inches long and 4 inches wide. The handlebar is 22.5 inches long and fitted with 117mm rubber hand grips. The scooter is fitted with rated ABEC 7 bearings for incredibly smooth and quiet riding experience. An IHC compression system, 3D stamped steel fork and customised Rear Nylon/steel brakes along with customisable 100/110 mm wheels are some other exciting specs of this product. This scooter features some really cool graphics and comes in 4 design options. Assembling this product is piece of cake as you only ned to tighten a few bolts to get it going. Weighing at 3.4 kgs, this scooter can carry weight up to 220 pounds and is suitable for persons above 8 years. See more information on Arcade Defender. Customizable fork and bearings to suit 100/110 mm wheels. Suitable for 8 years and above. The Arcade Defender is certainly a good product. With its customizable high -quality components, it makes for a sturdy product and offers a smooth riding experience. It is designed to be a beginner scooter and one can easily carry out all the basic tricks on this pro scooter. Coming at a reasonable price, you don’t have to spend too much and with several cool graphics options available, your kids would surely love winding through the streets with them. Another high-end scooter from one of the leading brands in pro scooters, the Lucky TFox Sig Pro from Lucky scooters boasts of some amazing features which is the result of Lucky’s expertise and collaboration with pro rider Tanner Fox. This pro scooter has an extra wide aircraft grade aluminium prospect deck at 4.25” wide and 19.5” length. Weighing at just 3.58 kg, it is super light and agile. See more information on Lucky TFOX Sig Pro. Extra wide prospect deck at 4.25” x 19.5”. The Madd Gear VX8 pro scooter is indeed a hefty and sturdy product. Weighing almost 4 kilograms, its weight is on the higher side. It has an extra wide aluminium deck at 4.8” and 20” long and comes with 120mm alloy core wheels. The chromoly handle bar is 24” inches high and 23” wide and comes equipped with 150mm TPR grips for your comfort. 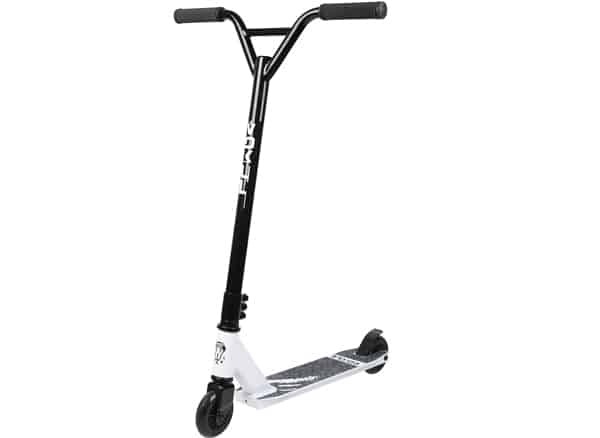 Coming at a slightly higher price, this pro scooter has additional features like Alloy HIC fork, composite flex brake and integrated headset for a smooth ride. The manufacturer provides a long 3-year warranty with this product for a hassle-free use. Equipped to carry weight up to 220 pounds, this pro scooter is suitable for riders above 8 years. See more information on Madd Gear VX8. Heavy pro scooter with a sturdy design. Extra wide deck at 4.8 inches. 120 mm alloy core wheels. The Madd Gear VX8 is one of the best premium pro scooters in the market and justifying the price, it has a sturdy design, with an extra wide deck and large wheels lend this pro scooter a premium look. The high-quality components ensure you always have a smooth ride and with a 3- year manufacturer warranty, you can be sure of its performance. The Playshion Pro Stunt Scooter falls in the mid- range category in terms of price and the build and performance is comparable to some of the best pro scooters in this category. This scooter is designed for beginners who are looking at serious options with attractive features. Weighing around 3.7 kg, this sturdy scooter is designed for heavy duty and can carry weight up to 250 pounds. The aircraft grade aluminium deck is 4.7” wide and 20.3” long and the handlebar is 22” high and 21” wide and made of high strength steel V bars. 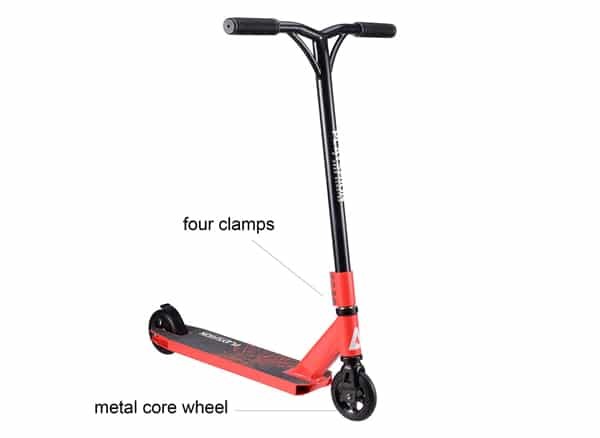 For a smooth and safe riding, this pro scooter comes with a 4 bolt clamp for a tighter connection between the deck and the bar. It has steel rear brakes and ABEC 9 bearings. The deck also has an anti-slip feature to keep your feet from slipping. It is suitable for riders 8 years and above. See more information on Playshion Pro Stunt Scooter. Sturdy scooter and can carry up to 250 pounds. Quadruple clamp for a tighter connection between the deck and handlebar. Anti-slip feature on the deck. Carry weight up to 250 pounds. The Playshion Pro Stunt Scooter is one of the best pro scooters in its price category. It has some good safety features like 4 pin clamp when usually scooters come with only 2 or three. The anti-slip feature on the deck is provided to prevent the rider from slipping while riding. The high-quality components and a sturdy design together with the safety features make it an exciting for parents to gift their kids. The carrying capacity of 250 pounds is also pretty high which means an adult can also easily go for a ride on this scooter. The Pulse Performance Products KR2 is one of the lowest priced pro scooters in the market. 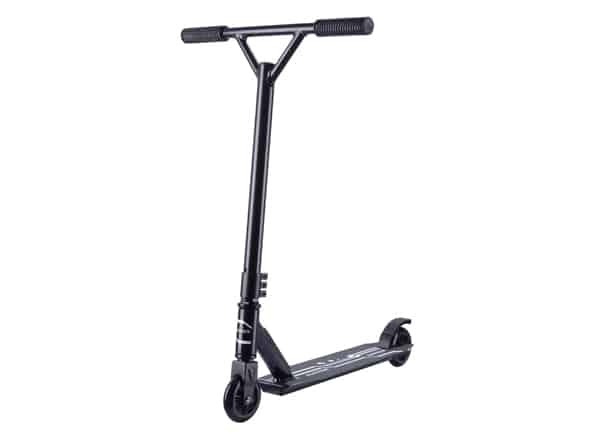 This pro scooter is suitable for riders above 5 years and can hold weight up to 140 pounds. It comes with all basic features needed to initiate your kid into scooter riding. The aircraft grade aluminium deck is equipped with grip tape deck surface to prevent the rider from slipping. The oversized handlebars with silicone ensure greater control on the two-wheeler. The KR 2 is equipped with some high-quality components as well. The 100mm urethane wheels with ABEC 5 bearings ensure a smooth ride and wheels come with flat spring-steel brake for safe and smooth stopping. See more information on Pulse Performance Products KR2. Suitable for riders above 5 years. High quality deck with anti -slip feature. Oversized handle bars with silicone grips for greater control. 100 mm wheels with ABEC 5 bearings. The PPP KR2 is a pro scooter which is easily affordable and comes with all the basic features to get your kid take to the world of pro scooters. With its amazing safety features you never have to worry about your child’s well-being. 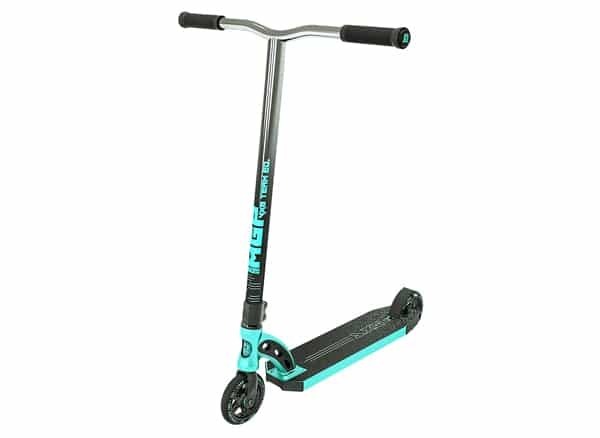 With its sturdy steel frame, high quality components and low price, this pro scooter would also make for great gift you can present your child with. The Sanview Pro S2 is the last on our list. 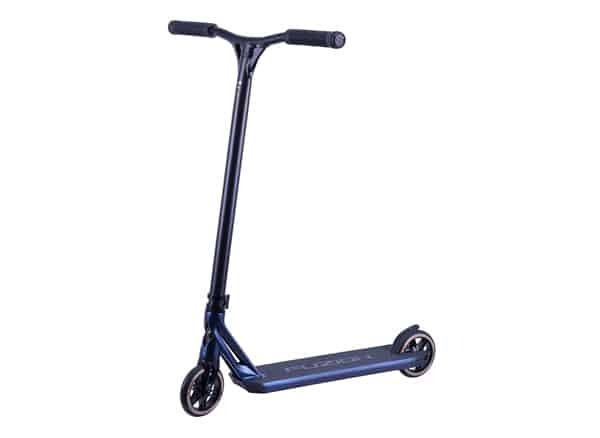 It is yet another beginner scooter for riders above 5 years and can carry weight up to 140 pounds but is priced higher than the PPP KR2 because of some superior features. The oversized handle bars and the extra wide deck of 4.7” and length of 20.3” make it ideal for any beginners. Weighing at 3.4 kg, it is lightweight and will provide speed and agility. This pro scooter is equipped with 100 mm rebounding PU wheels with ABEC 9 bearings. And the deck comes with an anti- slip feature to prevent the rider from slipping. The scooter comes equipped with a 3- bolt clamp for a tighter grip and a high-quality rear brake make for smooth stopping and less noise. As a bonus, this scooter comes along with a gift box which nicely packs the scooter inside. See more information on Sanview Pro S2. Oversized handle bars and extra wide deck for beginners. Triple clamp and high-quality brake. 100 mm wheels with ABEC 9 bearings. The Sanview Pro S2 is a beginner’s scooter and comes at a very affordable price for the features it offers. With its safety features and agility, it ensures performance and safety of the little rider. With an exciting gift box to hold the scooter, your kids would certainly be delighted to get their hands on this. 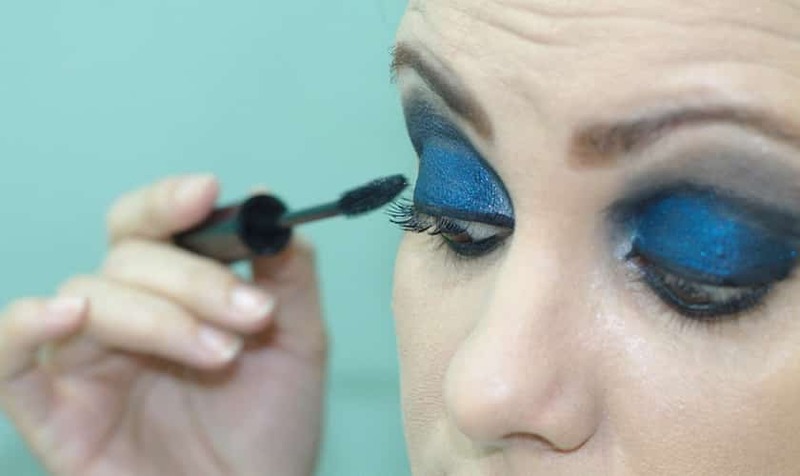 It is a good low-cost option to go for. Pro scooters is a nice way to combine leisure and exercise and you can ride anywhere you want – on the road, pavement, skatepark etc. These scooters are now becoming ubiquitous owing to their growing popularity. If you too are considering buying one, then there are certain things you need to know about so you can buy best pro scooter as per your needs. Bars: The bars usually are made of aluminium or steel. 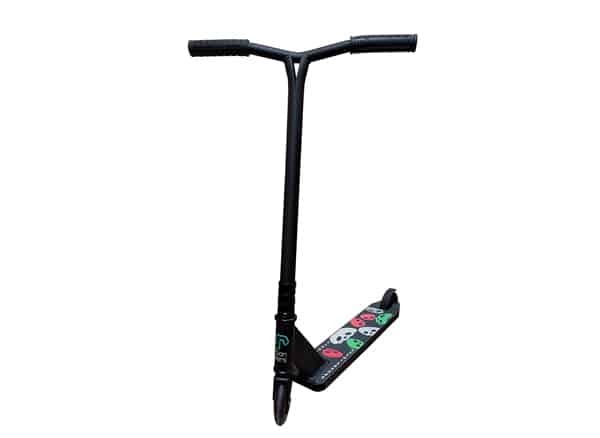 They come in standard diameter size of 1.25” but many beginner scooters come in oversized bars which have a diameter size of 1.375 inches suitable for a comfortable grip. Riders generally prefer customised bars that is convenient for them. These bars are fitted with a clamp and a compression system that holds them to the body. Deck: The deck is where you rest your feet while riding. It comes in different widths and lengths to suit the riders. Many of the high-end pro scooter decks are made in aircraft grade aluminium which makes them lightweight and able to withstand daily rough use. The decks may come with an integrated headset or non- integrated headset which has bearings installed in them whereas the non-integrated headset is preferred by riders who wish to customise as personal needs. Fork: The fork is the component which connects the wheel, the bar and the deck and requires a compression system to hold them together. Threadless forks provide superior strength and performance compared to the threaded one and are more preferable. Headset: The headset allows you to steer your scooter smoothly to carry out your stunts. Top end pro scooters will have a sealed headset which consists of a threadless fork and a compression system. It is always good to for an integrated headset as opposed to a non-integrated one. The integrated headset has bearing cups already installed which perfectly fit into the head tube and allows for a smooth fork rotation. Clamp: The pro scooter clamp holds your bars and the forks together so they don’t come loose while riding. There are usually double, triple and quadruple clamp which refers to the number of bolts in the clamp to tighten it to the fork tube. Wheels: Needless to say, wheels are an important component of any vehicle. Pro scooter wheels have two parts: the urethane and the core. The urethane compound and the core design vary across different vehicle. Entry level scooters will have a plastic core and higher end ones usually have metal cores. Another factor is the size of the wheel. Larger wheels provide more stability and speed. Compression: The compression system holds together the bars, deck and the forks so they come apart while riding. Most of entry level scooters have a threaded compression but they are not as reliable as some other superior compression systems such as HIC (Hidden Internal Compression), SCS (Standard Compression System), ICS (Inverted Compression System). Brake: The brake is also an essential component which is fitted on to the rear end of the vehicle. Most of the high-end scooters employ flex brakes as opposed to spring loaded brakes as they are more effective. A flex brake is essentially a piece of metal attached near the rear wheel which smoothly hugs the wheel without making too much noise. Safety Gear: Riding any vehicle poses some risk of injury due to any untoward accident. Same is the case with a pro scooter. But, use of safety gear while riding will ensure the security of the rider. Below is a list of some items which you can buy for a safe riding. Helmet: The helmet will protect you against any serious head injury in case you slam your head on the ground or any hard object. 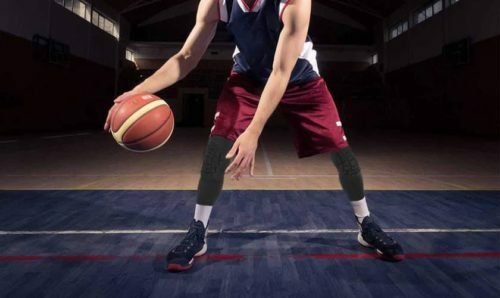 Knee Pads: The knee pad will protect you from any cuts or bruises to your knees. With the knee pad on, you can confidently slide without any fear of cuts. Elbow Pad: The elbow pad will protect your elbow from any cuts and you can confidently carry out your stunts. Wrist Straps: The wrist straps will protect your wrist from twisting or any unwanted injury. This information will hopefully enable you to buy the best scooter for you. It doesn’t matter whether you are a kid or a teenager, tall or short. Theirs is a scooter for everyone. With proper information you will be able to make the best buying decision.